Aug 12 • 10am-3pm: Learn about the "Royal Cloth" that was traditionally worn only in Okinawa's royal courts. Hawai‘i has the largest community of Okinawan descent outside of the Ryukyu Islands. With a history of more than a century, this community has maintained a distinct cultural identity, while at the same time contributing significantly to the rich diversity of the islands. Thanks to the strong ties between Hawai‘i and Okinawa, HoMA is fortunate to have an extensive collection of Okinawan art. This includes rare works from the Ryukyu Kingdom (1429–1879), which controlled an extensive maritime trade network and played a key role in the cultural and economic exchange between China and Japan at a critical point in the histories of all three civilizations. 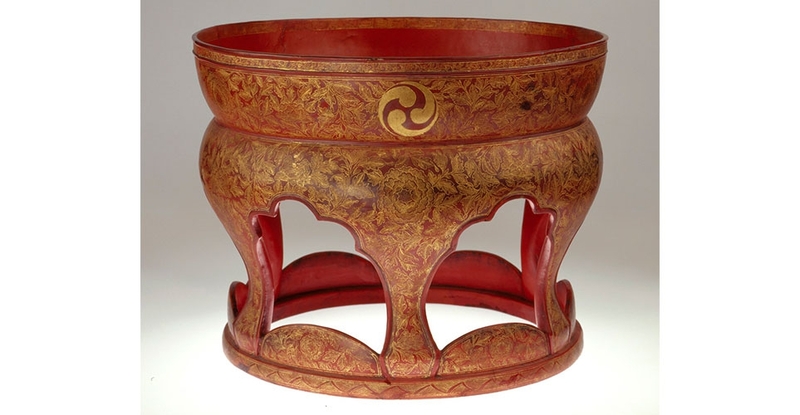 Among the greatest treasures of the museum’s collection is a gold and red lacquer offering stand, made in the 17th to 18th century for the Ryukyu court and decorated with the crest of the royal family, that is one of only three to survive. The other two are designated as Important Cultural Properties by the Japanese government. The stand is a highlight of the exhibition, which includes other Ryukyu Kingdom period lacquers, along with textiles and ceramics illustrating the Okinawan aesthetic through the 19th and 20th centuries and into today. The exhibition is accompanied by performances and other events that offer opportunities to experience the vibrant place of the Okinawan community in contemporary Hawaiian society.